May each year is the nation's mental health month. This year's May 19th celebration is a special day. 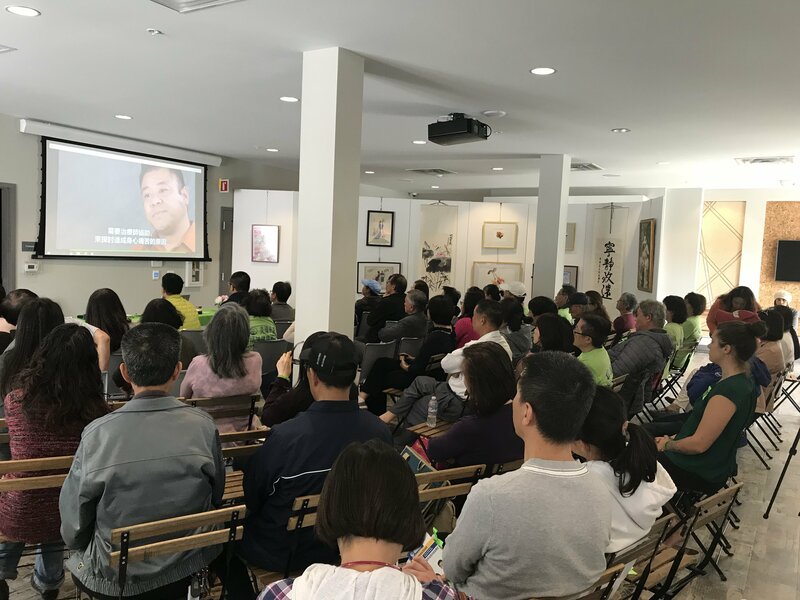 Under the leadership of the American Mental Health Association (NAMI), Chinese people have established the CHINESE NAMI Association, which can teach in their own language. American Chinese Mental Health Alliance (MHACC). 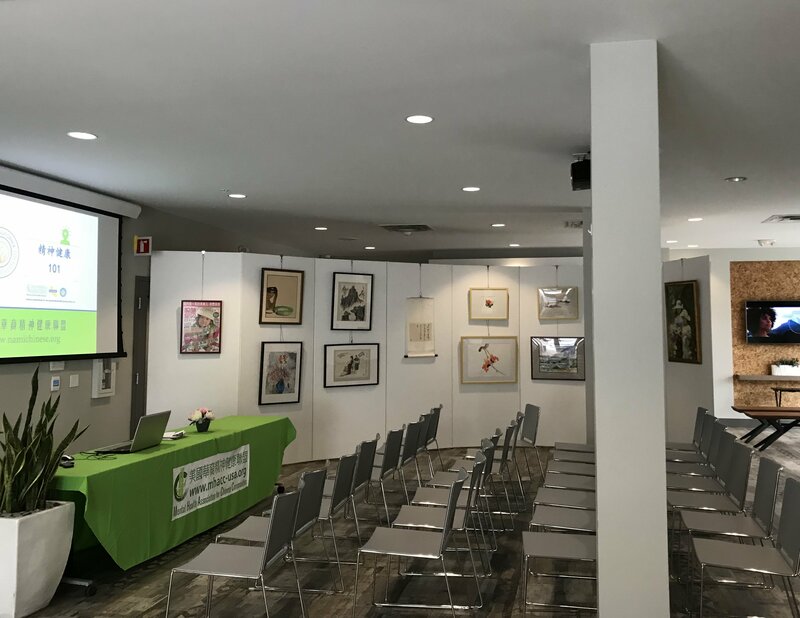 The founder, Elaine Peng and her volunteer team, after several months of hard working, held a special inauguration ceremony at the Fremont Artist Walk Gallery, a special exhibition. All artwork are from the patients, family members and volunteer groups. Through these beautiful paintings they showed the public their love of lives and their courage to fight with the sickness. This association is committed to help people suffering from mental health to have a good quality of lives. The organizers also hope that by organizing this event, they can arouse people's awareness of mental health and care for those around us. According to statistics, one out of every five people in the United States has suffered from mental health at some stage in life, and one in ten children and teenagers also have mental health symptoms, so it is very necessary to learn and share mental health knowledge. Many times, because of the silent tradition of Asians, we have not paid enough attention to the abnormal conditions of people around us, and have delayed the best timing of treatment; Or because there is no basic mental health knowledge, we are afraid of ordinary society’s misunderstanding while we lost the opportunities to get help from the experts in time to get good treatment you deserve. So learn and share mental health education is very important in modern busy society. NAMI was first established in the 1970s. It is currently the largest non-government mental health charity organization in the United States. It originated from a brave loving mother whose child was suffered from mental health problems so she found seven other families via newspaper ads and formed the first supporting group in 1970s . Today, we have the same experience from a brave and giving mother Ms. Elaine Peng in Chinese Americans community. As a family member, she has experienced the double pain of the death of her husband with mental illness and her daughter suffered from mental health as well. She has been supporting her family emotionally and physically for a long time. Under pressure, she used her strong perseverance overcome the difficulties. She also care for other similar families and volunteer groups to form the MAMICC of NAMI Chinese Division. She helped many Chinese families with similar experiences with her family's personal experience. Her daughter Irene Wei, after her mother's selfless care and encouragement, has also gone out of the trough for six years in the disease, and become a NAMI-certified community trainer and promoter to support her mother's mission. Irene used her artistic talent to create a youtube channel lixizu painting teaching, using life stories to inspire many people to pursue spiritual freedom and artistic dreams, and to life with passion. The story of this mother and daughter is very beautiful. At the event, many people are quietly crying. Their stories have made many similar families see the hope of life, like a bright light to see the direction of many lost people. Ms. Peng Yiling’s courage and love are very respectable. She teaches people every weekend, hoping that more families can benefit. The stories of their mothers and daughters have also attracted many families to join the volunteer team. They are growing and are getting more and more attention from the society. The event was also supported by the National Mental Health Association (NAMI) headquarters. Ms. Peggy Rahman, head of NAMI Alameda County, also brought her daughter and paintings to support the event. She wrote a message “NAMI Chinese is part of us” to the reporter. Another California NAMI community commissioner Catherine Chivers also took the stage to speak. 这次活动也得到了美国精神健康协会(NAMI)总部的支持。NAMI 阿拉米达县负责人Peggy Rahman女士也携患病女儿和画作前来支持，并写下“NAMI Chinese is part of us”的留言给记者。另一位加州NAMI社区专员Catherine Chivers也上台发言力挺.